Last Saturday afternoon I flew from Boston to Istanbul, Turkey, with a stop in Frankfurt. I arrived in Turkey Sunday afternoon and had to wait. And wait. And wait. I am travelling with a coworker who flew out of Providence and had a 6 hour delay on a flight from Dulles to Munich, and had to catch a later flight down to Istanbul. I had luggage and no grasp on the Turkish language. So I was stuck in the airport waiting for him. Seven hours later he emerged from the arrivals section without his luggage. Apparently his luggage hadn’t made it across the pond and went back to Providence from DC. It would show up several days later and require that we make the 7 hour round trip (with traffic and long delay dealing with Turkish Airlines luggage) back to the airport to pick it up. 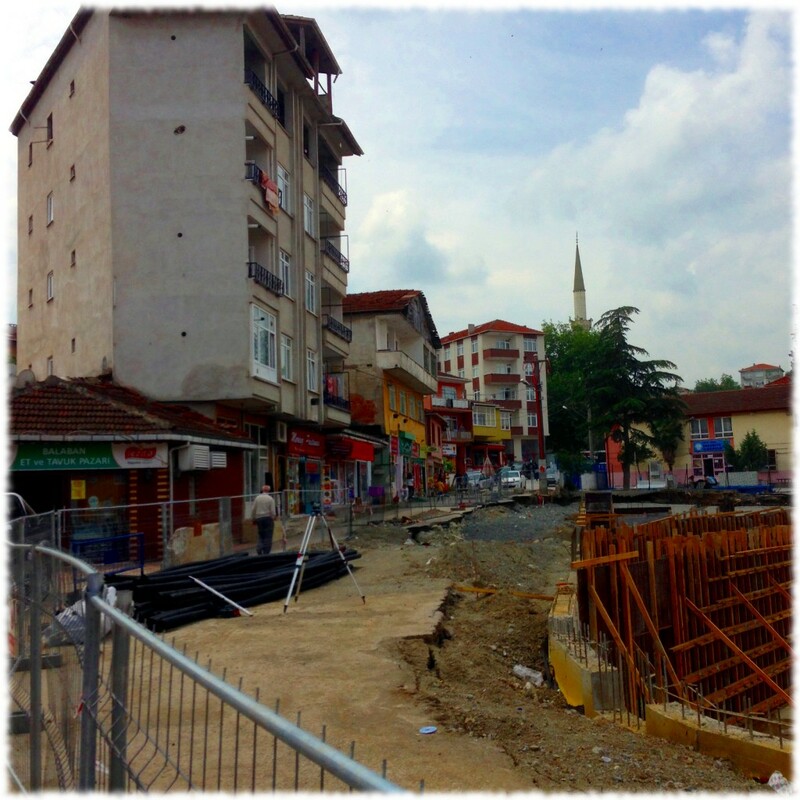 We departed that night for Izmit, on the eastern side of the Marmara Sea – a 90+ minute drive out of Istanbul. It is also on the Asian side, so this weekend I spanned three continents (the Istanbul Airport is in Europe). This was a work trip, so we were stuck staying near Izmit, which is nice, but not the most exciting of places to viist. We stayed at the Emex Hotel in Izmit and drove the 15 minutes to Gölcük where the Turkish Navy has its main base. The evenings weren’t too exciting. Dinner most nights in the hotel, and to bed early. Except Wednesday night. We had to do a drive back to Istanbul to pick up missing luggage – we departed shortly after work, and got back to the hotel after midnight. But heck, it was better than wasting an evening playing on the spotty Internet in the hotel and watching whatever wedding/dance/event was going on at the hotel that night. 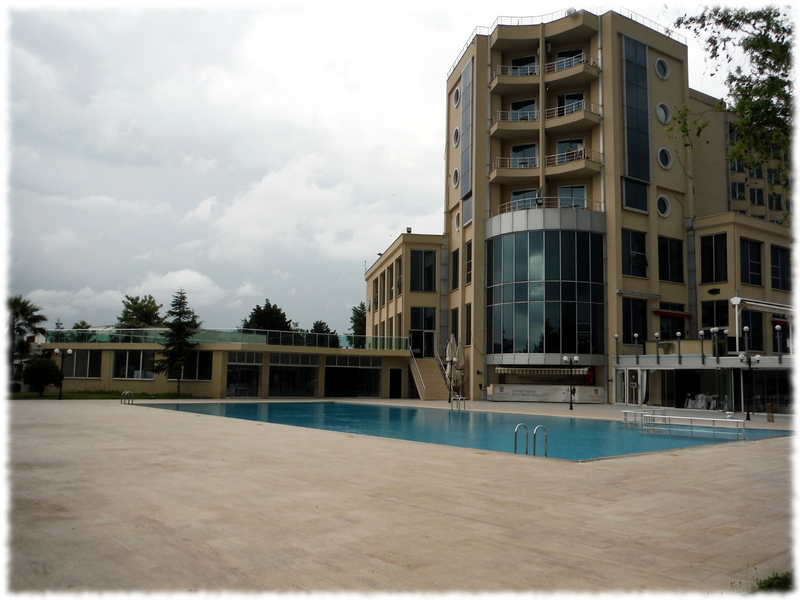 The Emex Hotel in Izmit. It rained all week so we didn’t get to use the pool. Lunches were much more exciting. Our hosts took us out to lunch each day. Monday we ate on the base at the officer’s club, but the rest of the week was off the base in town. Out of all the places I have been, I think the food here is the best. Tuesday’s lunch saw us on the coast west of the base in a part of Turkey that had been destroyed in a large earthquake in 1999. Wendesday we went back towards Izmit, and Thursday a group went with us to a small village south of the base to a hole-in-the-wall resteraunt. The place was crowded, but the food was outstanding. Thursday afternoon’s lunch was in the buildings on the left of the picture. The center of the village had construction going on, building a car park and playground. We finished up work early enough that we could head to Istanbul earlier than planned today. I’m staying in old town Istanbul, and am taking a day of vacation to tour the city (tomorrow). All I can say is Istanbul is huge. And crowded. It makes New York City seem small and open. I’ll post about my trip to Istanbul when I return. ← New O’Day 22 Mainsail!